CouchWarriors will continue to run an inclusive community event welcoming to new players, and first class tournaments that attracts top competitors from all over Australia. This partnership enhances the mission to further support the whole community by contributing to local, regional and interstate events with resources and assistance. Upcoming initiatives will look to fulfil these goals, as will the ongoing mission to produce special and major events. “Working with Couchwarriors will allow us to call on the experience and passion of their tight knit fighting game community, which means a better experience for fans, competitors and viewers at home, and puts us in a great position to spark some new life into the local scene”, said Jason O’Callaghan, Executive Producer of New Game Plus. Look forward to exciting announcements on special events such as a “Barfights” exhibition night, ranking battles and qualifiers, and more information on BAM closer to the event. The partnership is also tailored to work with other groups to assist with the implementation of a wide range of events, from game launches to LAN events, and is open to sponsorship discussions. For more information about these opportunities, please contact the representatives below. 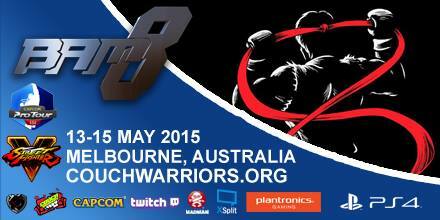 CouchWarriors Inc is a not for profit association created to energise the fighting game community. Starting in 2006 as an informal community group, it created an event series for social play and ranking battles which served as the heart of the Melbourne scene. The project has blossomed into large events like the major annual, Battle Arena Melbourne (BAM) and providing tournament services, support and resources for companion events. Made by a large portion of the team behind Level3, New Game Plus is a new look take on gaming TV. Incoporating a strong gaming focus, with a healthy dose of related subcultures, NG+ aims to bring you thoughtful reviews, exclusive interviews and event coverage, and the best videos from a range of specialist contributors. NG+ recently announced Twitch partnership, and stream Australian exclusive content weekly.